MathusTutor is an exclusive offering designed for High School students needing help in any subject – Math, Sciences, English/History (AP, Honors or regular) or in SAT/ACT. Highly qualified teachers will tutor students one-on-one and will customize the class to the student’s specific needs. Classes are offered online for students across the United States and Canada as well as onsite in Atlanta metro area. Typical one-on-one tutoring by big-name brands, often by average tutors, will cost $100 per hour or more. 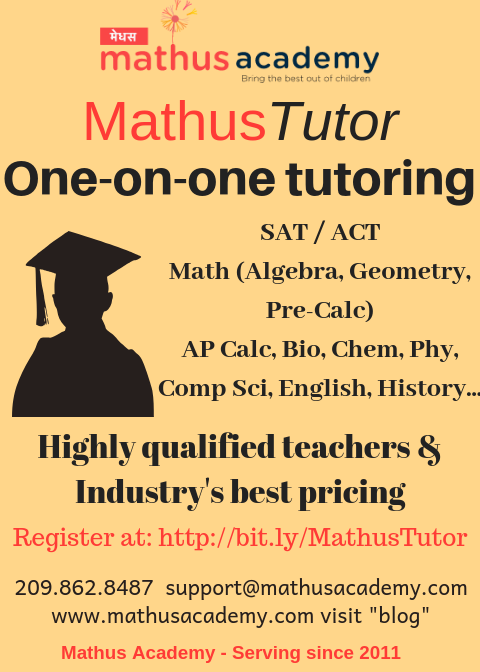 For the first time, Mathus Academy will offer high quality one-on-one tutoring at half that price-list. The interactive, focused, online one-on-one classes also bring convenience to your door-step (or table-top) saving precious commute time. For testimonials of existing parents/students, please click on ‘Testimonials’ on our homepage www.mathusacademy.com or simply type the URL www.mathusacademy.com/testimonials. Mathus Academy has traditionally only offered small group classes of about 5 to 10 students to keep the learning individualized enough while also leveraging the group dynamics. Over the years, we kept receiving calls for one-on-one classes for the High School students, but we resisted them for the longest time. However, as we talked to thousands of them over the years, we started understanding the legitimacy of their requests. The pace of High school and the high stakes involved in the High school courses, be it AP courses, SAT, ACT or plain Algebra 2, Geometry, Pre-Calculus, Chemistry, Biology etc, makes it imperative to customize the class to each student. On top of that, every teacher at every school, let alone every school district, follows his or her own sequence of topics, material and style. That introduces a perfect recipe for the absolute need for one-on-one classes. After years of study and analysis, we designed this course to meet the exact needs of the High school students. Thus is born MathusTutor. If you have any friends or family with high school students in need of tutoring, you may direct them here (or pass them the below contacts). If you have any questions, please feel free to reach out to us at [email protected] or call us on 833-4-MATHUS (833.462.8487).